Secret Paladin time calls for Desperate Measures. 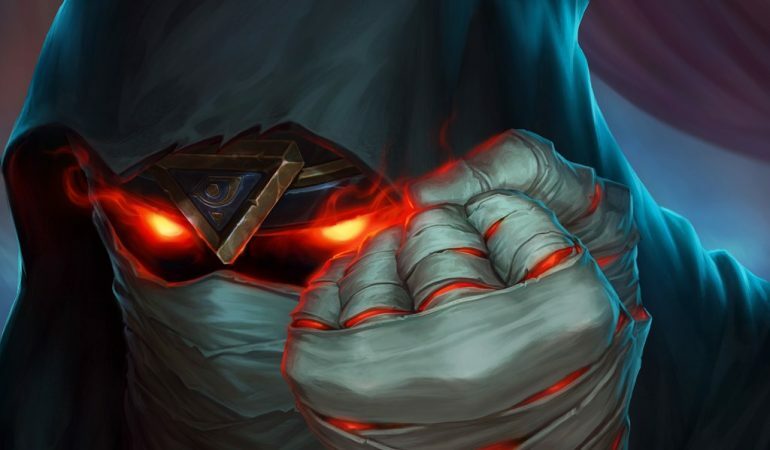 Hearthstone’s Rise of Shadows expansion is quickly approaching. Card reveal season is in full effect—and another new Paladin card has been unveiled. 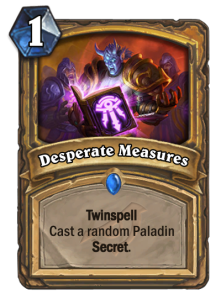 One of the latest cards to be revealed from Rise of Shadows is a Paladin spell called Desperate Measures. This card is a one-cost Paladin spell that takes advantage of the new Twinspell mechanic. Desperate Measures causes you to cast a random Paladin Secret. Thanks to Twinspell, after casting Desperate Measures, a copy of the card without Twinspell will appear in your hand. This card appears to be more evidence that Secret Paladin will be getting some big support with Rise of Shadows. Paladin was a juggernaut during the Year of the Raven and dominated through use of its Odd and Even deck variants. Both Odd and Even Paladin were nerfed on a number of occasions and are a big part of the reason why Genn and Baku are being removed from standard play a year early. It looks like Secret and Dragon Paladin might pick up the slack within the Paladin class. Check out Rise of Shadows to see exactly what’s coming to the Paladin class when it drops on April 9.